Here I am with another late Glossybox Unboxing. Im finding it hard to fit these into my content recently. Its taking the time out to set up the equipment and take the photographs, I can never do it. Or maybe its the winter season and the fact that it gets dark at 3pm. 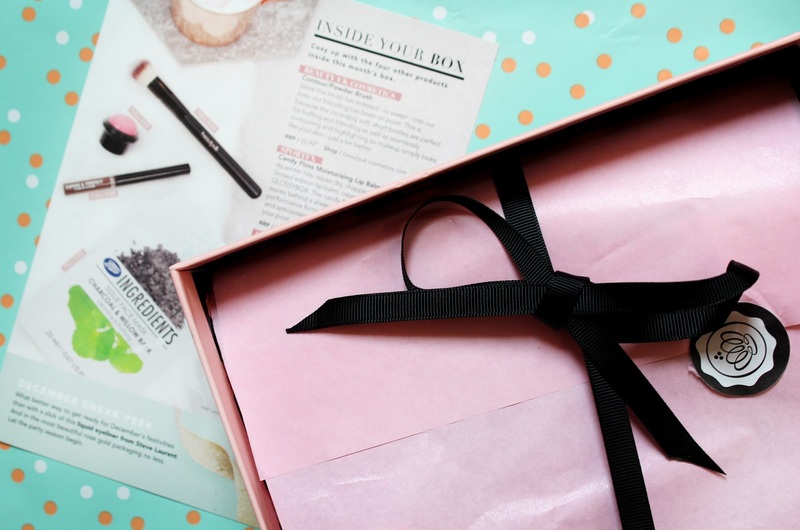 I've been thinking about the glossybox feature on my blog and how it's been going. I seem to not be as motivated to to write it anymore, maybe I've been doing it for too long? What do you think? I've written it for over a year now, is the content too dry? Let me know, I might take a break in the new year. But for today, here's what I received in last months Glossybox. 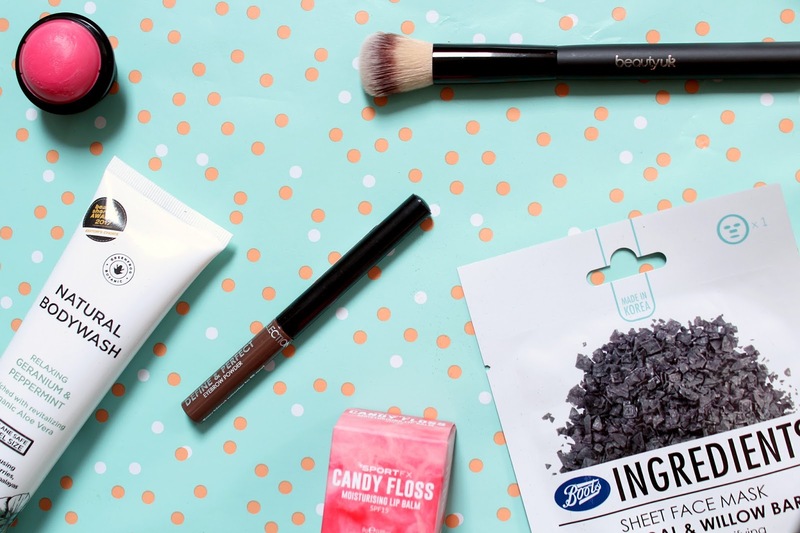 As a student getting bodywash, shapooos or anything like that in a Glossybox is a life saviour to me. I get to try out new products but ultimately it just saves me the trip to the shops. I really liked using this bodywash, it suited my sensitive skin and left me smelling amazing! I'm not a huge fan of the shower process, I mean I still wash obviously but I'm more of a bath girl. If I had the option to I'd definitely be taking baths everyday rather than showers, however products like this make me look forward to the whole process. It's nice to look forward to having a shower just because of a new bodywash. I love getting brushes in my Glossybox. Having one brush per item makes me feel very organised. I realise its completely unnecessary, you can just use one for multiple products, I just can't stand mixing brushes that have been used for powder with ones that have been used for liquid products. I've been testing this brush though on a few products nonetheless to see which one it suits more. I didn't really like it for contouring as I felt that it took too long to blend it out due to the size of the brush. I then tried it out for blusher and I think that I definitely preferred it for that as it applied the product fast and didn't take much effort to blend it out. I'll be using this one for my pinkier tone blushes (I have another one for peachy tones). I always struggle to find a simple lip balm that actually works. You always get some moisture from lip balms, but it normally wears of very soon. This time of the year your lips get super dry from the cold weather. I tried this out a couple of times and noticed the instant moisture that you get. I did top it up during the day but that was mostly because the colour faded. It has a hint of pink when applied on, nothing too strong though. The packaging didn't look amazing though, different then you would expect of a lip balm however nothing special, the plastic looked quite cheap. Overall I guess I'd use it if I didn't fancy wearing a lipstick but still wanted some tint. I remember trying it for the first time and thinking wow this is so easy to use! There's always that tedious process of applying product through, then having to brush it out. I use gels most of the time or pencils so powder was a whole new territory for me. I feel like this is something I'll use a lot from now on though. I have been having a lot of days where I don't want to have a full face of makeup so I'd just wear a CC cream with some mascara but I always want something quick for my brows. This might however go to Olis house, I have some products there like foundation and mascara however nothing for brows. I went through a massive phase with sheet masks last year and had this huge pile of them. I have just about ran out so getting this was great. They are indeed super weird and wearing it feels wrong but in a way it relaxes it too. Taking it off your face and it just feels so moisturised. With this specific mask I felt like it tightened my whole face, weird expereience. I also experienced some tingling from the charcoal and willow bark. Unlike other mask I did feel that this might have been slightly too strong for my sensitive skin. I had some red patches on my forehead but they did go away in a few minutes. Feel like it would have been fine if you had an oily face or if it wasn't that sensitive. Mine just goes red to anything new.